Two Schiff bases ligands (liquid crystals) have been prepared from benzidine. The texture diagnosed by optical microscopy of polarizing light (POM) technique, these ligands have nematic phase (Enantiotropy Phase), then characterized multi physic-chemical techniques such as (UV-Visible, IR, XRD and CHN). The results show that the type of textures was marble at heating and schleiren at cooling for all ligands. Ligands have polycrystalline structure and take square planar with crystalline size in nano dimension. Liquid Crystals Materials (LCMs) are mesophase pomp equivocation between profound and clear nation. It is mostly assemble a mesomorphic plight which is nation of moment in which the gradation of brownian arrangement is intervene between the three dimensional, belong-wander mealy and orientation attitude found in grave crystals and the destitution of hunger-sift direction found in isotropic liquids, gases, and uncrystallized compact . LCMs are finding rhythmical applications that of their ability to veer orientation of molecules in answer to very soft physical and alchemical humor, such as electromagnetic fields, surface modifications and pressure gradients . Where: (λ) wavelength of XRD (0.15407 nm), (β) (Full Width at Half Maximum in radiant), (θ) angle of diffraction, (Gs) grain size, (n) integer number represent the reflection ordering. Liquid pellucid properties were perscrutate by (POM) worn a Leitz Laborlux 12 pols attached to a Linkam with hasty level and digital camera. Electronic spectra of the ready compose were graduated in the country (200-1100) nm for (1×10 −3) M solutions in arbitrary ethanol at (28°C) using a Broker spectrophotometer matched quartz cell. Structural properties of ligands were diagnosed by XRD patterns. Molar conductivity measured in by using a (DDS-307W) conductivitymeter at RT. Melting points (M.P.) measured by SMP-30 capillary device. Ligands were prepared using a method previously reported in the literature . Benzidine (bislacetylace tlydine) prepared by mixed (1.78 g; 0.013 mol) of benzidine that dissolved in (10 mL) from ethanol in absolute state then added (3 drops) of glacial acetic acid to the mixture. The reaction was refluxed for 3 hrs, resulted transparence orange product. The resulted crystal was filtered then washed by absolute ethanol repeatedly and re-crystallization was made by same solvent. Benzidine bis (propayldine) was prepared by mixing (3.56 g; 0.01 mol) of benzidine dissolved in 10 mL of absolute ethanol, then added to the prepared mixture three drops of glacial acetic acid. Reaction intermixture was refluxed for 3 hours, inference sensational profound result. The producted crystal filtered and washed by the same method in (3.2.1) (Table 1). Table 1. Molar Conductivity and M.P. of LCs Ligands. From the images of (POM) test, it’s a clear that the nematic liquid crystal phase appear in two cases (heating and cooling) but in different form, where in heating state take (marble) form, but (schleiren texture) form in distinct separation droplets grow. Because of appear nematic LC phases in two cases, this is called (Enantiotropic LC phases) . Figure 1 below shows that the photographic image of (K1) ligand in two cases. So the reason of appear enantiotropic nematic LC phase return to found four aromatic rings in the chemical structure in addition of the nitrogen atoms assist the molecule by its length and hardness, so the continuous change in electronic positions on the length of molecules the led to increase the attractive forces (polarization) . Figure 1: Enantiotropic LC Phase of Ligand (K1). The two bands that appear in (UV-Vis) spectrum of these two ligands showed two bands at (352.50) nm wavelength assigned to (n→π*) and (293.00) nm wavelength assigned to (π→π*) . While the UV-Visible absorbance were (0.365-0.398) (Figures 2 and 3). Figure 2: UV-Visible Spectra of Ligand (K1). Figure 3: UV-Visible Spectra of Ligand (K2). The test of IR analysis is used to know the happen of chemical interaction or no by wave factor shifting and compare with original charts. The ligands (K1 and K2) shows intense absorption at (1627.89 and 1612.38) cm-1 to refer to (C═N) azomthine group in plane streaching vibration, and (1189.08 and 1028) cm-1 for aromatice groups (C-H) this group is active [11-13], also (1600 and 1554.52) cm-1 which may be assigned to (C═C) plane stretching vibration. Figure 4 exhibits a band absorption of (K1 and K2) of ligand respectively. Main characteristic of IR absorption bands of ligands are presented in Table 2. Table 2. IR Characteristic Bands Frequencies (cm−1) of the Ligands. The crystal structure of compounds has been examined by (XRD) spectrum. Each compounds (K1 and K2) have polycrystalline structure. The (Gs) has been theoretically calculated by equation (1), so the values lying in the range between (12-61) nm. Figure 5 represent (XRD) pattern of (K1) ligand. 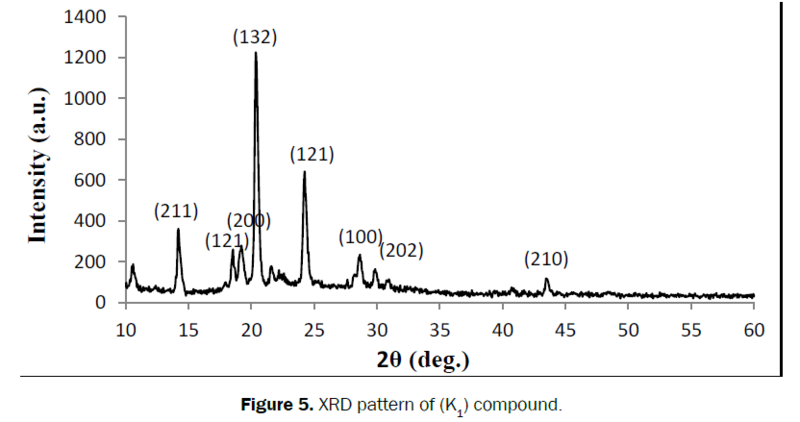 Figure 5: XRD pattern of (K1) compound. The measurements of Molar conductivity measurements for all complexes in DMF solvent by the ratio (1:1) have been measured. The values lying in the range between (25.7–124.5) (cm2/Ωmol) to refer that electrolytic solution has been prepared . This result indicates to the effect of addition and the response of chloride ions to transfer the charges, as a clear in Table 1. From CHN analysis, we concluded the chemical interaction is true. There is a good agreement between the theoretical and practical of C, H and N values, so the Table 3 shows that theoretical and experimental CHN values. Table 3. Comparative of CHN Values. i. The Enantiotropy liquid crystal phases appear in two cases for all compounds. ii. K2 has two different bands gaps. iii. No chemical interaction (lower K factor). iv. (K1 and K2,) have polycrystalline structure. v. The resulted electrolytic is intrinsic organic semiconductor with square planar. vi. CHN shows that a good agreement between theoretical and practical values. Imran T, et al. 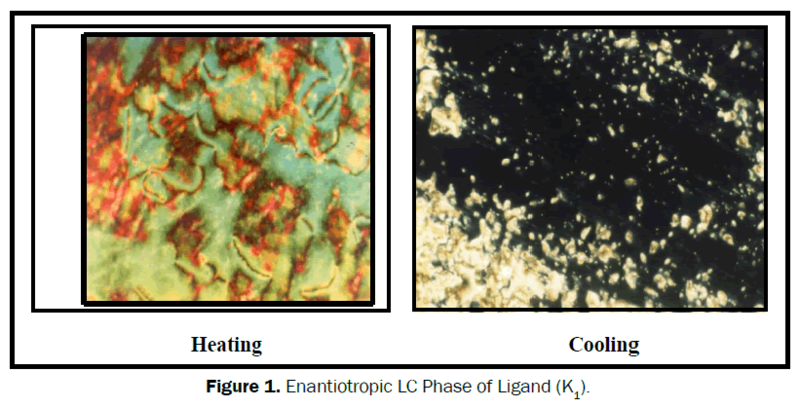 Liquid crystals pharmaceutical application: A review. J Int Pharm Res Allied Sci 2012;1:6-11. Yang D and Shin W. Fundamentals of liquid crystal devices. John Wiley 2006;1-37. Liliana C, et al. New compound with potential liquid crystal properties. III. synthesis, characterization and mesomorphic ordering of N, n’-bis-[4-(4’-octyloxy-benzoic)-ester-benzyliden-n-propyl]-piperazine. J Chem Bull" POLITEHNICA" Univ Timisoara 2005;50:1-2. Theivasanthi T and Alagar M. X-ray diffraction studies of copper nanopowder. Scholars Res Library 2010;1:112-117. Mustafa B, et al. Synthesis and X-ray powder diffraction, electrochemical, and genotoxic properties of a new azo-Schiff base and its metal complexes J Turkish chem 2014;38:222-241. Obeid A, et al. Preparation and Study Some Properties for Liquid Crystalline Material. Int J Adv Multidiscipl Res J 2-10. Khalil K and Sadeem M. Synthesis, characterisation and liquid crystalline behaviour of some lanthanides complexes containing two azobenzene Schiff base. J Liquid crystals 2014;41:1303-1314. Sanyucta K. Lanthanide Complexes of the Mesogenic Schiff-base, N,N’-di-(4’-octadecyloxybenzoate)salicylidene-l’’,3’’-diamino-2’’-propanol Synthesis and Structural Studies. J World med res 2014;3:1-9. Karar Abdali. M.Sc. thesis, College of science, Babylon university, Iraq 2010. Pattanaik S, et al. Synthesis, characterisation and biological evaluation of bidentate ligands (reduced schiff’s base) with metals of copper, nickel and zinc complexes. Rasayan J Chem 2011;4:136-141. Sulekh C and Poonam P. Synthesis, spectral characterization and biological evaluation of chromium(III) complexes of Schiff base. J Open Inorg Chem 2014;4:30-40. Ibrahim OB, et al. Nano sized schiff base complexes with Mn (II), Co (II), Cu (II), Ni (II) and Zn (II) metals: synthesis, spectroscopic and medicinal studies. Can Chem Trans 2014;2:108-21. Leelavathy C and Arul S. Structural elucidation and thermal studies of somenovel mixed ligand Schiff base metal (II) complexes. J Int Basic Appl Chem Sci 2013;3:88-95. Riyadh M, et al. Metal Complexes of Macrocyclic Schiff-Base Ligand: Preparation, Characterisation, and Biological Activity. J Scientific World 2013;2013:7.